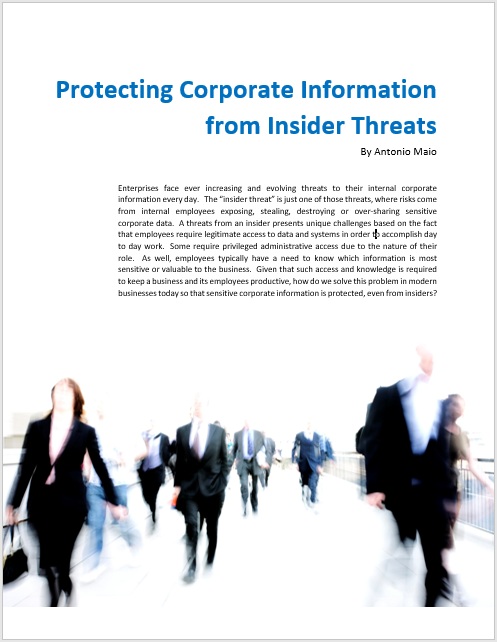 Enterprises face ever increasing and evolving threats to their internal corporate information every day. 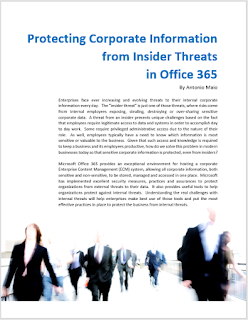 The “insider threat” is just one of those threats, where risks come from internal employees exposing, stealing, destroying or over-sharing sensitive corporate data. A threat from an insider presents unique challenges based on the fact that employees require legitimate access to data and systems in order to accomplish day to day work. Some require privileged administrative access due to the nature of their role. As well, employees typically have a need to know which information is most sensitive or valuable to the business. Given that such access and knowledge is required to keep a business and its employees productive, how do we solve this problem in modern businesses today so that sensitive corporate information is protected, even from insiders? Microsoft Office 365 provides an exceptional environment for hosting a corporate Enterprise Content Management (ECM) system, allowing all corporate information, both sensitive and non-sensitive, to be stored, managed and accessed in one place. Microsoft has implemented excellent security measures, practices and assurances to protect organizations from external threats to their data. It also provides useful tools to help organizations protect against internal threats. Understanding the real challenges with internal threats will help enterprises make best use of those tools and put the most effective practices in place to protect the business from internal threats.